Five hours to kill in Tokyo with a visa valid for three months. Once upon a time I'd have made the most of it, arriving at the gate drunk, wearing a policewoman's helmet and carrying a traffic cone. Today I'm going to seduce this beer instead. The last 24 hours have been a bit rocky. I moaned at my dad for waking me up half an hour before my alarm, and then had to eat my words when the D660 north of Beaumont was closed and we had to scramble along the side roads to get to Bergerac in time for my train. Which meant we had to scoot to the next station 30 kilometres away. We made it and I caught my connection in Bordeaux. 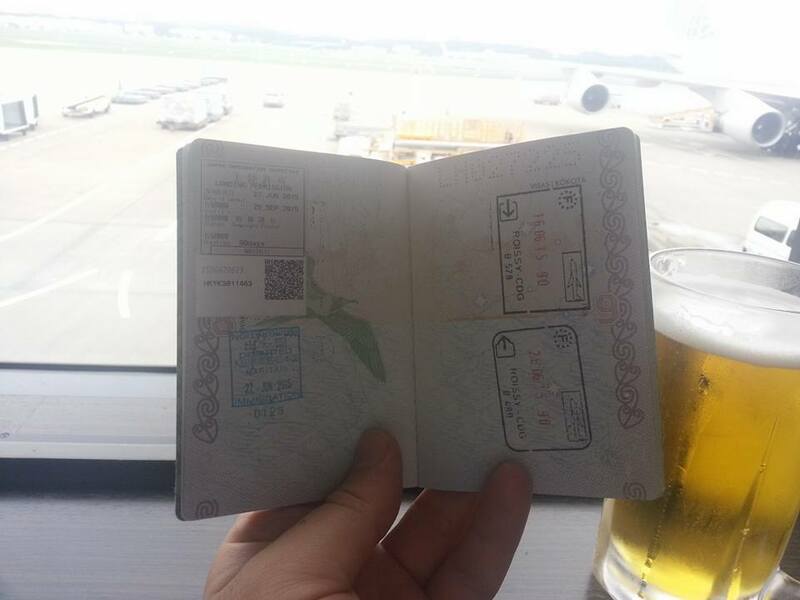 Border security confiscated my cologne in Paris and took my fingerprints in Tokyo. Both annoyed me greatly. And the air conditioning at Narita is set way too high. I should be back in Auckland in fifteen hours and sitting in my first meeting in nineteen. As charming as this pretty young beer is and as delightful as that prospect is, I think I should have spent another week or two living it up in Dordogne. Stupid Simon. Stupid, stupid, stupid. I started to feel queezy on the bus ride up to the Colca Canyon. The day before we'd travelled from the town of Puno on the shore of Lake Titicaca to the city of Arequipa, the first civilisation I'd seen in weeks, since Boliva and La Paz. Along the way an English friend and I made the injudicious decision to eat from a road-side stall. And now I was feeling decidedly nauseous. I'd been pretty good over the last several months, maintaining my usual discipline for travelling in the Third World: keeping up with my meds, avoiding meat, washing vegetables in iodine, eating fresh. The road-side stall had been an aberration and man, was it about to cost me. It's early in the day when the bus arrives at the viewing plateau, already there are half a dozen other buses parked up and a couple of hundred tourists focussing their cameras. The prohibition on making noise is laxly enforced, though most abide by the constraint. We all want to see the Condors soar and they won't if there's too much noise or activity from the tourists, so remaining silent is in our collective interest. The wisdom of the herd. I'm not feeling well at all, under almost any other circumstances I'd stay on the bus. But how often in life does one have the opportunity to see something so magnificent? I rouse myself to make the most of the opportunity and if I'm honest, so that I could tell myself that I'd been there and done that. I watch the Condors ride the thermals along the canyon for all of five minutes before it's time for me to retire to the comfort of my seat. The bus is about 50 metres away and I tell myself that the walk and the fresh air have reinvigorated me. I do feel a bit better even though my stomach grumbles alarmingly. "You hear that, Mr Anderson? That is the sound of inevitability." I'm halfway to the bus when inevitability takes me. I have just enough time to drop my trousers before my bowels explode so hard I'm convinced that I've distended myself. 200 hushed people turn around. And I'm crouched in the middle of the parking lot by myself with my trousers around my ankles, moaning. Partly in nausea and partly in relief. The mess around me is a puddle of excrement large enough to fertilise a small farm. I could not have been more exposed. I could not have looked more ridiculous. Some of the tourists take pictures. Some point and laugh. All of them take my dignity. And I have an epiphany: in debasing myself so utterly, I am liberated from the propriety of polite society. Nothing I could ever do would redeem me to this audience. Humiliated and liberated, a burden has been lifted. I can do as I please. I think I've just become a sociopath. I pull up my trousers and walk stiff-legged to the bus, free of the need to meet the expectations of the herd. Finding fortuitous tissue and water in my pack, I clean myself up.